If, by chance, you happen to find yourself in Portland on May 17th and 18th (Fri. and Sat.) we are going to have a few things happening there as part of Focus on the Beer and Beers Made By Walking. If you’re in Colorado Springs, you can head to the Deschutes Tap Takeover we helped organize at Brewer’s Republic, and know that somewhere in Portland, someone is looking at a poster of the event, wishing they were drinking with you. On May 17th, Focus on the Beer will have a few posters up at the Autzen Gallery for a show titled “Alum.” The exhibition’s theme is to show current and past artwork from alumni of the Art & Social Practice program at Portland State University. 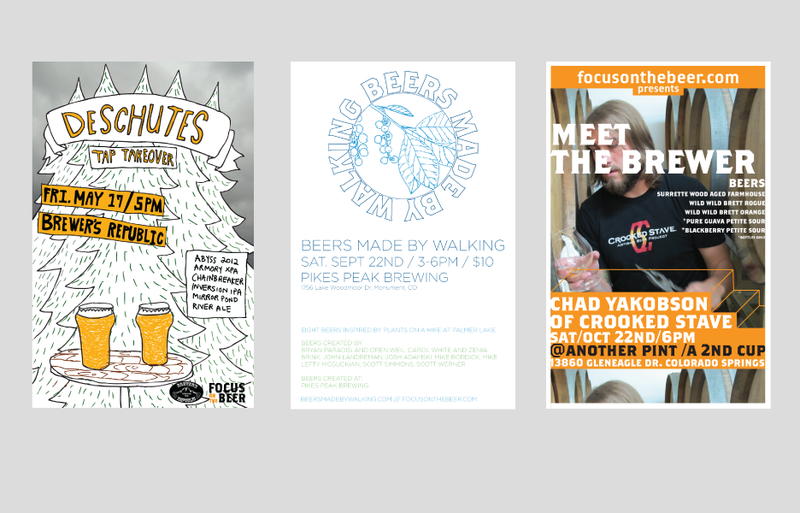 I definitely enjoy designing all the posters for the events we organize, all of which are either educational in nature or are an effort to build a stronger and larger craft beer community in the Pikes Peak Region. So, I’m really happy to be able to show the posters. There will be six printed posters, and one hand-drawn poster from our 2nd Anniversary party. On May 18th, I am leading an urban walk for Beers Made By Walking with the brewers of Coalition Brewing and Upright Brewing. We will start in front of Coalition, at 2724 SE Ankeny, at 5pm and we will identify plants in local parks, parking lots, medians, and in people’s front yards. The beers will be made later this summer and tapped in October during our larger BMBW Portland tapping. The walk is free and open to the public.